Our expert professional staff also offers the most stylish manicures, pedicures with the worldwide renowned OPI products. Intimate Film Rosin is desigened to adhere to the hair and not to the skin. allowing fot exceptional grip even on the shortest of hair. by removing the entire root. leaving a sliky smooth finish.this next generation of wax. with no strip required simply apply this like a strip wax and remove like a hot wax,thus allowing you tou use Intimate on all parts of the body. We want to assure you that OPI is committed to the safety of our consumers and of Beauty Professionals, and emphasize that we have always taken the necessary steps to ensure that our OPI products exceed safety standards. 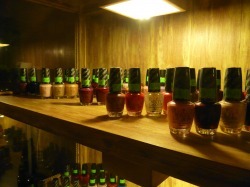 As our OPI nail polishes don't contain formaldehyde.